Piracy, Copyright Infringement, Plagiarism, Website Blocking, Trans Pacific Partnership (TPP) and on and on it goes. Why would anyone create music? The record labels via the RIAA have screamed black and blue that piracy is decimating the business. They fought tooth and nail against every digital service and start-up. Yet year after year, it was digital music that was making a fortune for them, because all digital monies are pure profit. There are no manufacturing costs (like vinyl and CD’s), there are no warehousing and distribution costs and there is no breakage. Remember Napster. It showed the recording industry what the majority of customers want. Access to cherry pick the song they want and access to listen to whatever they want. 17 years later, you can say that what Napster started has almost become a reality. The only outlier is that people still want to download mp3’s for free. Which brings me to Scott Ian! Can someone please explain to him what stealing really means because he is making metal heads look stupid and uninformed? Downloading a copy of an mp3 is not stealing because the mp3 is still up on the web for streaming, purchase or downloading. If anything, it is copyright infringement. But the question that he fails to ask is why are fans of Anthrax downloading their music illegally? They download music and have no intention to pay for anything, not even a concert ticket of the said artist? They download music because they have no other way to get it? They download music because they don’t want to pay Apple to download it, but they want it on their phone, and have every intention to purchase a concert ticket when Anthrax hits their town? I can go on and on with different types of viewpoints of fans. The value of music was originally inflated, because we, the customers had to buy an album worth of songs for the three, maybe five good songs. The hard-core super fans will always purchase, however the rest will do what they want to do, when they want to do. As a collector, I still pick up CD’s of bands when they are super cheap like $5, years after the album was released and after I’ve streamed the album to death. And they are still in the plastic wrapping which I am sure once I have joined the afterlife, my heirs will commit them to a second-hand store or just toss them. The value of music is different from person to person. But how many artists can safely say they know who their hard-core fans are. I bet you there are always fans who purchase deluxe bundles, every time the said artist releases an album. Is that buyer information getting filtered back to the artist? It’s these fans, Scott Ian should be caring about. Are they getting any bonus offer, a loyalty card, a discount to a concert or a simple personalised thank you that makes the fan feel special for supporting the artists with every release? Imagine the fan getting a hand written letter sent to their address that thanks them for purchasing the last four super deluxe bundles of the said band, and here is a bonus mp3 album for you to download plus a special VIP pass for their upcoming concert. Instead, the fans are made to feel like criminals, for streaming an album instead of buying, for cherry picking a few songs instead of paying for all of them or for downloading the album illegally. That’s not the way it’s done anymore. In August 1984 Metallica, Anthrax and Raven played New York’s Roseland Ballroom. Anthrax opened the show, then came Metallica and the headliners were Raven. Jon Zazula was the promoter of the show, forming Megaforce Records to sign and promote all three bands. He sure did his homework/promotions and over 3,000 people attended the show, along with a lot of major label executives. For Raven, it was an accumulation of ten years hard work to get to this point. They built up their career by playing all the tough and confrontational workingman clubs in Northern England. As was the norm for bands of that era, early albums on smaller independent labels led to major label contracts. Raven was no exception and a major label deal with Atlantic Records followed after. The pressures to deliver a more commercial sounding album that could cross over, alienated the original fans and didn’t really gain any new fans. Today, Raven is more or less forgotten. Spotify stats are under 20,000 streams. YouTube has the song “On And On” at 211,697 views and “Lay Down The Law” has 171,772 views. No one is listening to them. For Metallica, that show was the biggest show for the band up to that point. Michael Alago former A&R, at Elektra Records was there in attendance and he wanted to sign to Metallica to the label. Today, “Enter Sandman” has 31,205,811 streams on Spotify and the official video on YouTube has 40,758,247 views, while a live version has 72,499,306 views. “Nothing Else Matters” has 27,925,987 streams on Spotify and the official video on YouTube has 62,987,299 views while a live version has 40,884,893 views. “One” has 86,077,668 views on YouTube and 13,304,900 streams on Spotify. 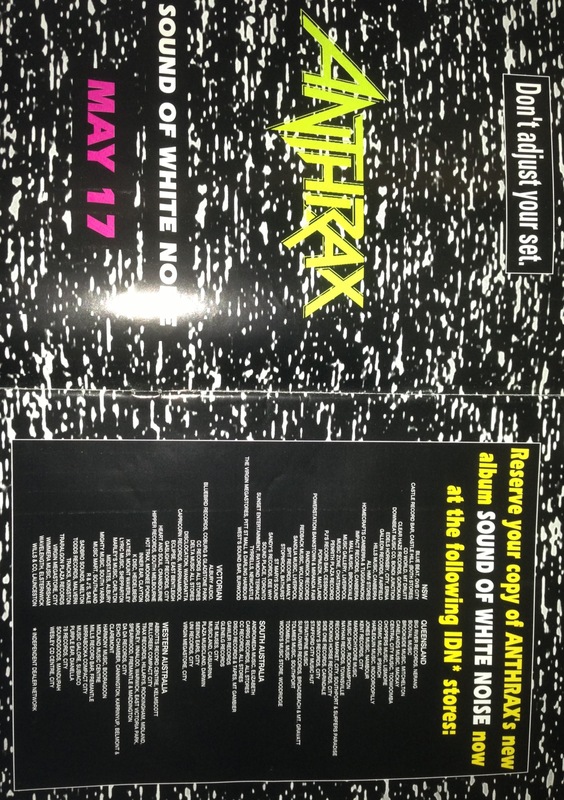 For Anthrax the show was a combination of three years hard work to that point for the band. The band wouldn’t get a major label deal until after “Persistence Of Time” when Elektra came knocking. On Spotify, “Madhouse” has been streamed 1,716,342 times. On YouTube the same song has been viewed 6,986,320 times. “Indians” has 4,279,543 views on YouTube and 732,107 streams on Spotify. “Got The Time” has 3,606,042 views on YouTube and 1,442.115 streams on Spotify. Clearly the opening bands went on to great achievements compared to the headliners. The record labels that signed them would be flush with cash from the sales of records. Elektra struck big with Metallica.With each album release Metallica kept on getting bigger and bigger. Meanwhile Atlantic didn’t get the results they wanted from Raven. After three disappointing albums (the first one was the strongest of all three), Atlantic dropped them. It’s funny how the music business works. 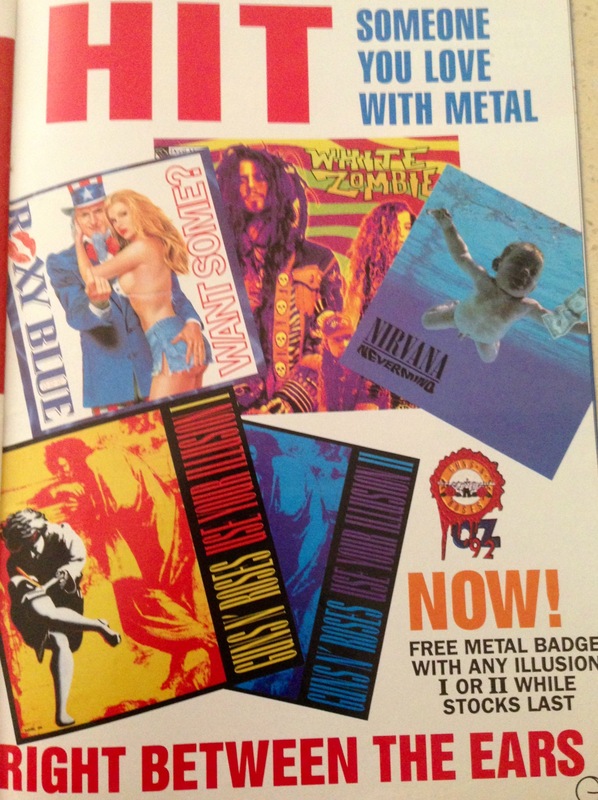 It’s June 1993 and I am flicking through the new issue of Hot Metal Magazine, which at the time was Australia’s premier metal and rock magazine. For $3.50 it was an excellent alternative to the overpriced American and British magazines. On the cover there was the John Bush fronted Anthrax. Three members are wearing white t-shirts with blue Jeans, and two members are wearing black t-shirts with blue jeans. It was a sign of the changing times as publicists and record labels pushed their artists to have a more grungy look. “The Sound Of White Noise” got 5 skulls in the magazine review, which equates to ‘KILLER’. A few months after it’s release the album was certified GOLD. This is probably the album that Scott Ian was referring too when he made his comments that in the past they would sell a shitload of albums. It was a hungry album. John Bush’s transition from a struggling band to a major label act was the catalyst. It was an album chock full of metal “hits”. “Only” comes to mind straight away. Even James Hetfield called it the perfect song. “Black Lodge” didn’t sit out-of-place with the current crop of chart toppers in Soundgarden and Alice In Chains. Credit producer Dave Jerden who produced both “Dirt” from Alice In Chains and “The Sound Of White Noise”. It was the last good Anthrax album and it is not even up on Spotify. Actually none of the John Bush-era of Anthrax is on Spotify which is a shame. And the critics that said “Worship Music” is a great album cannot understand why it didn’t resonate with the audience. Look at the top ten songs on Spotify for Anthrax. Not one song from “Worhsip Music” is on the list. Same goes for YouTube. Then you have the bloodbath from the Eighties scene. Jani Lane (RIP) and Warrant had split and both acts had their contracts reduced to demo deals. So even though you had three albums that had moved 500,000 plus units each, they still ended up on the scrap-heap. Kik Tracee also split with vocalist Stephen Shareaux (bet he wished he tried harder for that Motley Crue vocalist spot) and both of them had been reduced to a demo deal. Looks like all the promo to sell the act just didn’t connect with the audience because in the end the songs where rubbish. Meanwhile Rowan Robertson from “The Lock Up The Wolves” Dio era inked a deal with Atlantic Records for his new band that had Oni Logan from Lynch Mob on vocals. We all know that this didn’t end up going anywhere. While, Roberston’s former employer, Dio (RIP) was working with WWIII guitarist Tracy G after his “Dehumanizer” venture with Black Sabbath went sour. These sessions would go on to create the “Strange Highways” album while Jake E.Lee was working with WWIII singer (and i use that term loosely) Mandy Lion. Reports coming through at that time spoke about the new Bruce Dickinson solo album being an “updated, toughened up Santana vibe with a heavy leaning towards Peter Gabriel type atmospherics and experimentation.” That album would become “Balls To Picasso” and apart from the song “Tears Of The Dragon” which sounds like an Iron Maiden song the rest of the album was a listen best avoided. On the drug front we had David Lee Roth getting busted in New York after purchasing a $10 bag of weed. Seriously, for someone like his stature surely he could have done it more discreetly or gotten that $10 bag delivered to the studio. However, Roth is Roth and he decided that he should go out into the town and look for a dealer. On the other drug front, there was news that started coming out about Tim Kelly (RIP) from Slaughter who was alleged to have been involved in a major drug smuggling ring that was busted after a five-year investigation by the F.B.I. Then we had the Motley Crue vs Vince Neil shenanigans. The Vince Neil “Exposed” album got a good review in the magazine. I suppose it was inevitable that the solo album from Vince Neil would sound a lot like Motley Crue, even though NIkki Sixx insisted that Vince Neil had nothing to do with the creation of the songs in Motley Crue or the Motley sound. I think Nikki Sixx missed the memo that the actual voice plays a big part in the sound. Credit music business vet Phil Soussan for delivering a stellar performance in the songwriting department that helped kick-start Vince’s solo career. Then on the other side you had “The Scream” with new singer Billy Scott battling to get their album done in time so that they can tour with Motley Crue as part of the singer transfer deal. For the uninitiated John Corabi from “The Scream” replaced Vince Neil in Motley Crue. However, the Crue’s album was REJECTED by Elektra Records. It wouldn’t be until the following year that the self-titled Motley Crue album saw the light of day. And within 6 months it disappeared from the public conversation and the tour got reduced from arena’s to theaters to getting cancelled. Finally Pride and Glory was still on hold while Zakk Wylde worked with Ozzy Osbourne on the follow-up to “No More Tears”. Producers John Purdell and Duane Baron took over from Michael Wagener (who produced the first few songs and was then retained to mix the album until Micheal Beinhorn got involved). James Lomenzo was being used as a bass replacement for the recording sessions. The album that would become Ozzmosis would take another two more years before it saw the light of day and the style of the songs would be re-imagined into the modern sound of the day. In the end the majority of artists mentioned above are still part of the music business in some way. And for the ones that aren’t, only death could separate them from the music world.